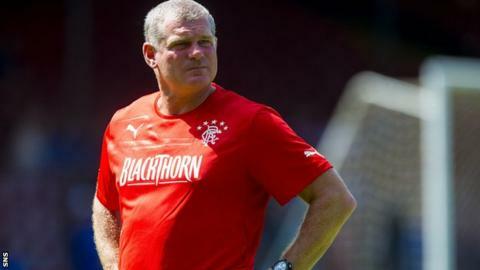 Ian Durrant has been demoted from his role as a first team coach at Rangers following manager Ally McCoist's exit. The former Ibrox midfielder will now take charge of the club's Under-20s side. Ex-Rangers striker Gordon Durie, who was Under-20s coach, will help Kenny McDowall with first team matters, as will club captain Lee McCulloch. McDowall was made caretaker boss after McCoist was placed on gardening leave on Sunday night. Durrant played for the Ibrox outfit from 1984 to 1998 and returned to the club as a coach in 2005. The 48-year-old was part of the backroom team under previous boss Walter Smith and McCoist. And McDowall revealed he was left to tell Durrant the news of his demotion. "The board intimated to myself that Ally had been put on garden leave and they told me they were going to make some changes to the structure of the coaching team," he said. "Gordon was to come up from the (under) 20s to assist me and they wanted to make Lee a player/coach, and I was to start immediately. "Was my opinion sought? No, they asked me if I could make those changes immediately. But the decision was made by them. "As for Durranty, that was the board's decision too. They asked me to carry it out which I duly did. "I was asked to inform the guys of the changes being made." Looking ahead to his first match in charge against Hibernian on Saturday, McDowall explained that he was not planning major alterations to team selection or approach. He said: "There's not a whole load I can change because everything Ally was doing was with my backing. "The players appreciate that they have got to do a bit better on the park in terms of consistency. But these guys are good players. They don't just become bad players overnight. "Because they are Rangers players, everything is scrutinised - every last pass. But they know they need to keep their standards high."